CRF ALL OVER INDIA TILL 15.09.2017 SINCE 01.06.2017 RECORDED 764.1 MM AGAINST NORMAL (51-2000) OF 814.3 MM.CUMULATIVE % DEPARTURE MINUS - 6.2%. 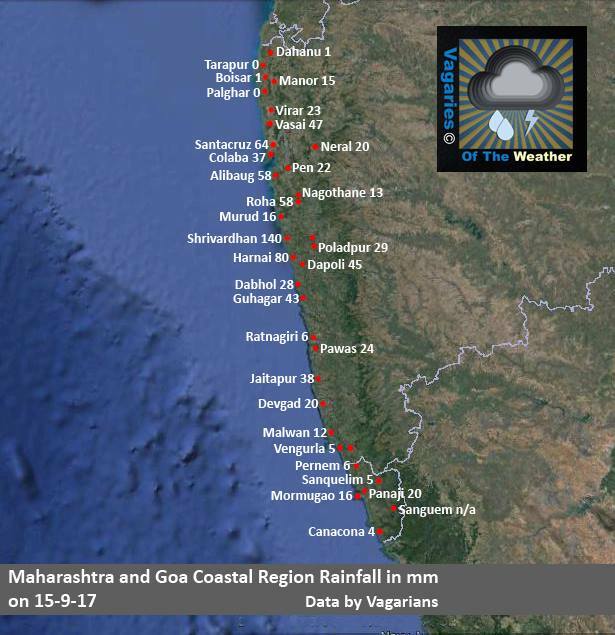 SEASON FOR IMD WILL CLOSE ON 30.09.2017 FOR RAINFALL RECORDING DURING THIS SEASON 2017 PURPOSES EVEN IF MONSOON DOESN'T WITHDRAW FROM ENTIRE COUNTRY BY THIS DATE. According to the private weather forecasting agency, Skymet, a cyclonic circulation over Chattisgarh would lead to rainfall over NW India from 22-25 Sept. Is this forecast valid Rajesh Sir? What do you think would happen to the SWM withdrawal? 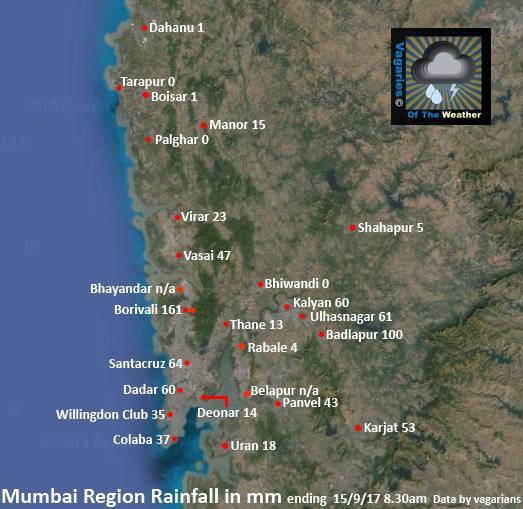 Rajesh sir,it seems more rains are in store for north and nw india....in this case when do you expect monsoon to withdraw from mumbai? IMD says monsoon revival from sept 22 ??? Always some interference in monsoon withdrawl - vagaries opinion is final.